Giving a comprehensive and concise edit summary will help other understand the revision history. Why the edit was done is more useful than what was edited — a diff will show what was edited but not why. 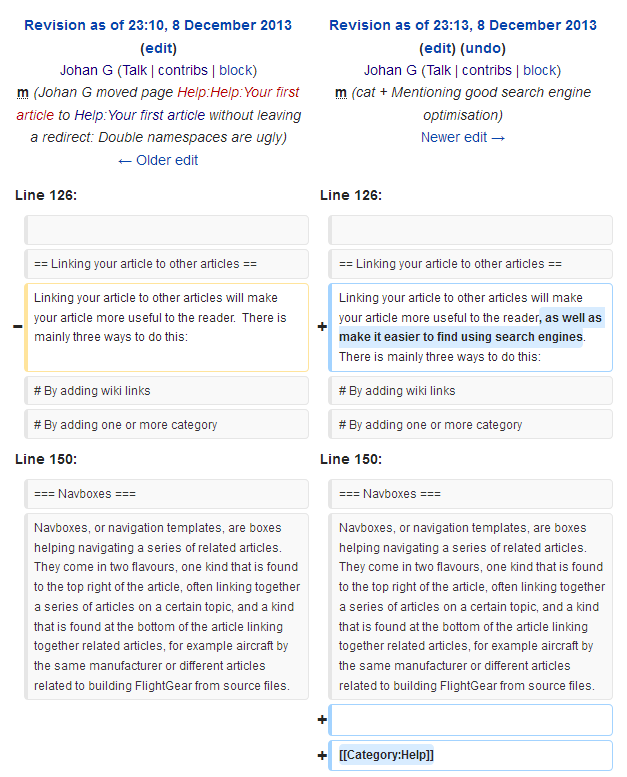 One of the main characteristics of a wiki that like the FlightGear are using the MediaWiki software is that the edit history of all pages is preserved and is available to everyone. This allows for very transparent collaboration. As the revision history of pages is kept, changes can be tracked in various ways. The page Special:RecentChanges is a list of all the recent changes on the wiki. If you want to have a feel about what is going on on the wiki you could start your wiki session by having a peek at that page. As it shows all the latest changes it is often the place where one will find any spam, vandalism or other unwanted edits. 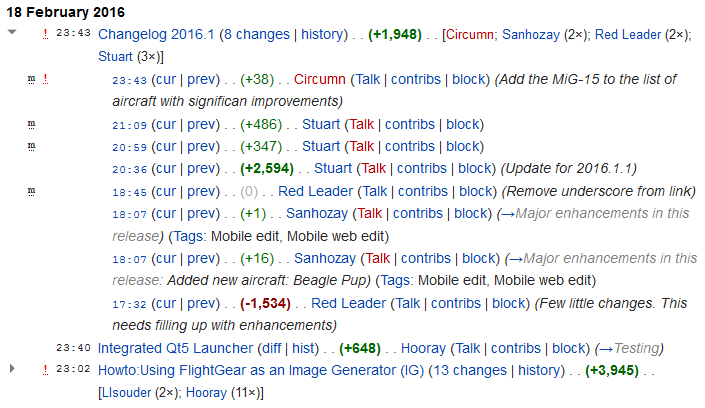 Recent changes on the wiki. Only some users have rights to block users. The watchlist will help you keep track of interesting pages if the recent changes page is too busy. The watchlist presents changes the same way as the recent changes page. The watchlist is accessible from a link in the top right corner of every wiki pages when you have logged in. At first the watchlist will at first be empty, but pages can be added to it either by clicking the watch tab (the star icon tab) or by clicking the "Watch this page" box below the edit summary text box when editing or creating a new page. The revision history of a page, accessible from the history tab, holds all the changes to a page. Some data regarding deleted revisions is only available to users with sufficient rights. The revision history allow you to look at and compare selected revisions using page diffs (or often just diffs), as well as link to a certain revision or comparison of revisions. Tip If you need to compare two separate pages you can do so with Special:ComparePages. Tip By pressing the Show changes button when you edit a page you can see your changes as a diff. It can be useful when writing the edit summary. A diff is comparison between two revisions of a page. With them you can see what was changed, added or removed in a revision. A diff page is typically shown with the actual diff at the top of the page and the rendered page as of the latter revision at the bottom of the page. The diff itself is split into two columns: Typically the old one to the left and new one to the right. On top you have the dates and usernames as well as the edit summaries added before saving the revisions. 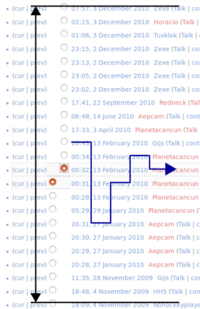 Below that are the changed chunks of lines and a few lines surrounding them. Tip If Johan G above had used the Show preview button more he might have remembered to add the other changes as well. Finding an edit through successive approximation. If you are looking for when a particular section of text was edited, you can use binary search/successive approximation. Start by comparing the revision between the oldest and newest possible revision with its previous revision. Then in halfway steps compare revisions with their previous ones till you find the edit. This can come in handy for example if you want to discuss a confusing phrasing with the user who added it, or if you are an administrator and need to find a specific user due to spam etc. This page was last modified on 10 June 2018, at 03:50.